We are meeting at Arundel. The obvious route is by the M4, A34, M27 and A27, but Google suggests a different route. My driving time, apart from my coffee break, was about 3 hours. If you want a coffee break, there are only a few services available. Chieveley services at the junction of the M4 and A34 is probably the best, but it is less than halfway and has an awkward exit. Sutton Scotney is about halfway, but offers less. After that there is nothing obvious. We will park at Arundel, in the Lido pay-and-display car park, from which the walk starts. Be ready to start walking by 1330. You should make your own arrangements for lunch. There are pubs and cafés in Arundel, or you could eat a picnic at the river. Another option is to use one of several pubs which you pass on the way. This is the easiest walk of the weekend. Having crossed the bridge we follow the River Arun upstream for a couple of miles. We will be walking on top of the flood defence, so the walking is easy. There are good views of Arundel Castle to the left. We then follow the road past the Wetland Centre before turning into the Castle grounds. 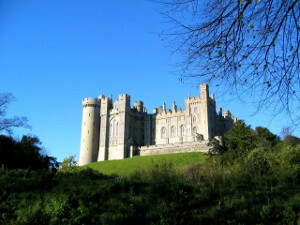 Having followed the bank of a lake, we climb gently and eventually come out on the main road into Arundel. We follow this through the town past the Castle entrance and back down to the river. Click for a map of the walk. There is a possible shortcut which needs no navigation skills, and which takes a lot off the walk and makes it totally level. After the walk we have a drive of 15 or 20 minutes to Abingworth Hall. Remember to notice the large roundabout at Whiteways; tomorrow’s car park is just off it. Dinner will be at 1915. © Copyright Darren Hill and licensed for reuse under this Creative Commons Licence.